Eyelid surgery / Blepharoplasty is recommended for those patients who have excess fat deposits or bags above or below the eye. These puffy fatty deposits can make you appear tired or angry. Incisions are typically made in the creases of your upper eyelids and just below the lashes in your lower eyelids, making scars virtually invisible. After the underlying fat and excess skin are removed, the incisions are closed with fine sutures designed to leave nearly invisible scars. In a Transconjuctival Blepharoplasty, the plastic surgeon makes the incision inside the lower eyelid. No skin is removed and the incision is closed with dissolving sutures. Eyelid surgery / blepharoplasty usually takes between one to three hours as an outpatient procedure under general or "twilight" anesthesia. Stitches are removed in about one week. Strenuous activities can be resumed in about three weeks. Scarring is usually minimal after three weeks and undetectable in six months. Lower eyelid blepharoplasty is a plastic surgery used to remove the fat deposits and loose skin that can form on the lower eyelids with age. Factors, including heredity, smoking, and sun damage accelerate these changes. Younger people also elect to have this procedure done to eliminate puffiness of the eyes from congenital excess of fatty tissue. Blepharoplasty is frequently combined other procedures, such as upper eyelid blepharoplasty, facelift or forehead lift, and can be combined with chemical resurfacing to smooth skin wrinkles. When overhanging of the upper eyelids interferes with vision, and both upper and lower eyelids are done at the same time, the upper eyelid procedure may be covered by insurance although not often. If you're considering lower eyelid blepharoplasty, and want more detailed information, please fill in our get a quote form to set up a consultation. Common Benefits Of Lower Eyelid Surgery Lower eyelid blepharoplasty can make a remarkable difference in the appearance of the face, helping the appearance of tiredness and old age by eliminating the excess, wrinkled skin beneath the eyes. The eyes appear fresher and more youthful, and the results will last for many years. A facelift for saggy jowls. 1. How is lower eyelid blepharoplasty performed? 2. How long does this surgery take? 3. Will I have to stay in the hospital? 4. How much pain is there? 5. What can I expect after surgery? 6. What is the recovery period like? 7. What is the long-term outcome like for most people? 8. Who is an deal Candidate? 1. An incision is made along the lash line. 2. Excess fat, muscle and skin are removed. 3. Fine sutures are used to close the incision. 4. Permanent stitches will be removed 3-5 days after the procedure. If you have a pocket of fat beneath your lower eyelids, but do not need to have any loose skin removed, your surgeon may recommend a transconjunctival blepharoplasty. In this procedure the incision is made inside your lower eyelid, leaving no visible scar. It is usually performed on younger patients with fatty lower eyelids. Transconjunctival blepharoplasty does not tighten the skin, but nicely reduces the puffiness in the lower eyelid region without visible scars. 3. Incision is closed with self-dissolving sutures or they will heal naturally without sutures. Lower eyelid blepharoplasty generally takes about one to three hours to complete, depending on the technique used and the extent of the repair. Lower eyelid blepharoplasty is performed on an out patient basis, in a surgical suite under local anesthesia, sometimes with light sedation by mouth. After surgery, the physician will lubricate your eyes with ointment to reduce dryness in this area. Your vision may be blurred temporarily from the ointment. The first two days after surgery, you should rest with your head elevated. It will help to gently apply cold compresses to your eyelids. At first the incisions will be red and somewhat bumpy. Eventually, the resulting scar should become flat and inconspicuous. Your sutures will be removed within the first three to five days. The swelling and discoloration around your eyes will gradually fade, and you'll start to look and feel better each day. Swelling and bruising varies a lot from person to person. Bruising typically disappears within ten days. Within the first week you will be able to use makeup, if desired, to conceal any discoloration. Your vision may be somewhat blurry for a few days or longer. Your eyes may be temporarily sensitive to light, and you may experience excess tearing or dryness. You may receive eye drops to help relieve any itching. Your surgeon will recommend lying quietly with eyes primarily closed for the first 36 hours after your eyelid surgery. Neither a facelift nor it’s recovery period are painful. Most patients experience a mild discomfort after surgery that is relieved with oral medication. The discomfort is usually in the back part of the neck and it is usually gone by the morning after surgery. * With no known medical conditions such as uncontrolled high blood pressure, circulatory problems, hypothyroidism or other thyroid related conditions. The above is only a partial list of the criteria that your surgeon will consider in determining whether or not this procedure is appropriate for you during your consultation. 2.) Puffiness in the inner corner and middle of the upper eyelid caused by the pushing forward of fat. Blepharoplasty is frequently combined with other procedures, such as a lower eyelid blepharoplasty, facelift or forehead lift, and can be combined with chemical resurfacing to smooth skin wrinkles. If you're considering upper eyelid blepharoplasty, and want more detailed information, please fill in our get a quote form to set up a consultation. Upper eyelid blepharoplasty can make a very noticeable improvement in the appearance of the face, reducing the appearance of tiredness and old age. The eyes appear fresher and more youthful, and these results last for many years. 1. How is upper eyelid blepharoplasty performed? The upper eyelid incision is made in the natural skin fold. Excess skin and fatty tissue is removed, the muscles and orbital septum (a thin connective tissue membrane) may be tightened. The external incisions are hidden within the natural fold in the upper eyelids. Much of the operation is done with a very fine electrocautery, which controls any bleeding. The skin is then closed with very fine sutures. Upper eyelid surgery, blepharoplasty generally takes about one to three hours to complete, depending on the technique used and the extent of the repair need to be performed..
Upper eyelid surgery ,blepharoplasty is performed in a surgery center or hospital as an outpatient. Local anesthesia is used often with the addition of light sedation by mouth. Patients return to their hotel with their personal assistants the same day. Initially, you may feel a tight sensation around the eyes, with minor discomfort that lasts for a day or two. A pain reliever can be taken as needed although most patients do not require it. 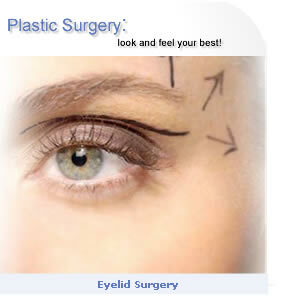 People who have had the procedure are often surprised at how painless eyelid surgery can be. Recovery time can vary from person to person You will be able to return to light activities within 5 to 7 days. After surgery, your surgeon will lubricate your eyes with ointment to reduce dryness in this area. (Your vision may be blurred temporarily from the ointment.) The first two days after surgery, you should rest with your head elevated. Your surgeon will most likely recommend gentle application of cold compresses to your eyelids and that you lay quietly with your eyes mostly closed for about a day. At first the incisions will be red and somewhat bumpy. Eventually, the resulting scar should become flat and inconspicuous. Your sutures (stitches) will be removed sometime within the first four to five days. The swelling and discoloration around your eyes will gradually subside, and you'll start to look and feel better each day. Swelling and bruising varies considerably from person to person. Bruising typically disappears within seven to ten days. Within the first week you can use makeup, if desired, to conceal any discoloration. Your vision may continue to be somewhat blurry for a few days. Your eyes may be temporarily sensitive to light, and you may experience excess tearing or dryness. You may receive eye drops to help relieve any itching. The more alert, youthful look that this surgery provides is usually long lasting. Thin scars may remain slightly pink for several months, but are easly concealed with makeup. They will fade to a thin, nearly invisible white line. The removal of fat is permanent, but the looseness of the skin and fine wrinkling of the eyelid area can return in the future. (remember sunscreen is the best plastic surgeon!) Even though the aging process continues, patients are usually happy with their appearance for many years following eyelid surgery. * With no known ophthalmologic conditions such as glaucoma or detached retina.